Herb Trimpe used to own a 1939 Stearman, which is an open cockpit biplane. When we worked together at Marvel, he’d often invite me to come upstate where he lived to go for a ride. Even after the Marvel days, sometimes, when we’d run into each other. I never got around to it. Always too busy. Now, let me tell you something about my father. He loved airplanes. All kinds. He used to build model airplanes, including those radio controlled ones. So, during the VALIANT days, when he came to New York from the family home in suburban Pittsburgh, one of only two times he ever made it to the Big Apple, I had this brilliant idea. Why not ask Herb to take him for a ride instead of me? I happened to have business up Herb’s way anyway. I figured that my father could come with me and therefore, we’d be in the neighborhood. This would have been in 1990, by the way. Probably August. JayJay, Jim and Jim’s dad, Ken. 1990. One problem. The only day we could make it was the day Herb was taking his daughter to college, in Syracuse, I believe. That’s about 140 miles from where he lived as the crow—or biplane—flies. He was already in for a long day. Loading up the car, driving, moving daughter in and driving home. Too bad. It seemed like such a good idea. 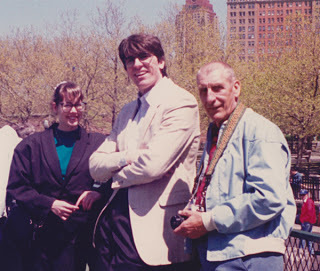 I think that day, my father and I—and Bob Layton was with us, visited Barry Windsor-Smith at his house, not too far away. Barry made us an excellent lunch and showed us his studio. And he was really nice to my father. Thank you, Barry. It was great. Then we headed down to the little airport near Kerhonkson. We were there early. Eight PM came and went. No Herb. Eight-thirty came and went. No Herb. It was starting to get dark. We figured, well, it just didn’t work out. Then a station wagon came flying into the gravel parking lot sideways at about 90 miles per hour. That may be a slight exaggeration, but not much. Herb jumped out, said words to the effect: “Come on!” and led us sprinting to the hangar. Time for niceties later. Before you know it, old Pops was in the front seat, Herb was in the pilot’s seat—both wearing those old fashioned leather helmets—and they took off into the wild, ever-deepening-blue yonder. Later, he told me that Herb did all kinds of tricks, rolls and loops and such. Perfect. Herb managed to stretch the fading light long enough to take Bob up for a while and me up for a quick spin. He was conservative with me. I think he believed because I had turned him down so many times, I must be afraid of flying. Nah. I even went skydiving a couple of times, but that’s a tale for later. Thanks again, Herb, for providing a highlight reel adventure for my father. He spoke of it often and happily till he died, eleven years later. Found out that when Bill Mantlo was in a nursing home in Georgia, I lived about 2 miles from where he was. Small world. Defiant 1: If you are a fan of Trimpe's, check out the b&w Savage Tales magazine, volume 2, published by Marvel in the mid-80s. #s 1 through 4 have a great strip, written, pencilled and inked by Herb called Sky Warriors. There's also some really nice work by Gray Morrow, Mike Golden, John Severin and others. I'd like to say that for all the professional issues I had with Bill, I had no personal ones. I'm very sorry about what happened to him. I wouldn't wish that on anyone. He was always friendly and personable when we worked together. You couldn't help but like the guy. Even professionally, while the plagiarism was disturbing, he did a number of good things, too. He was willing to pitch in and do the jobs nobody else wanted. He worked well with Steve Ditko on ROM and did some good things with the Micronauts. For that matter, he was the one who suggested that I consider licensing Micronauts. And he created characters in droves. I sincerely wish him and his family well. Peter David did not write Hulk. He wrote some other character using the same name. I also have no interest in a red Hulk, a son of Hulk, and all the other garbage that Marvel has tossed on the name as extra baggage. Hulk sales without a variant were down to 38,000 copies. That is not only sad, it's pathetic. I was not a fan of Bill's writing. I was a tad bit baffled to learn that he's still in a coma. That's a long time to be unresponsive. Barry came to me with a completely penciled and written graphic novel. It was the about the development of the "mighty, raging fury" inside Bruce Banner, who, he revealed, was the product of an abusive home. I looked it over. I thought it was brilliant, one of the best comics stories I'd ever seen. I offered Barry a contract and an advance. He turned me down — temporarily. He proposed to finish the thing — then, if I would agree to publish it as created, no alterations whatsoever, he would sign a contract and take the money. I was willing to agree to that in writing on the spot, but he said, no, when it's finished. Okay. Fine by me. I already knew, from what he'd shown me, that there'd be no problem. Barry showed the work around a bit to people in the office. I guess he allowed Al Milgrom or someone to make photocopies of it. Ask Al. I was later given to understand that Al kept the copies in the Hulk drawer of his flat file. Bill Mantlo, looking through the drawer to see what current Hulk artwork had come in, saw the copies. He then blatantly ripped the story off for a regular issue of the Hulk. In those days, I was on the road a lot, spending time in Europe with the licensees, at our London office, in L.A., or on licensing trips elsewhere. The book went to press without my seeing it. How Al didn't notice, or someone else didn't notice, I don't know. Barry was furious. I don't blame him. He, however, blames me, as of the last time I heard. Okay, the buck stops here, I suppose. ASIDE: This wasn't Bill's first shot at plagiarism. He routinely recycled other peoples' Marvel stories — Goodwin's Iron Man stories, old Stan and Steve Spider-man stories…others. Many of those recyclings happened before my time as EIC. But while I was EIC, he ripped off a Harlan Ellison story for an issue of the Hulk. That issue I signed out — but I had never seen the episode of Outer Limits (I think) that Bill had ripped it from, so I didn't know. I remember thinking what a good story it was, and that Bill must be improving. The day the book hit the stands, Roger Stern called me and said, "Are you nuts?! This is a Harlan Ellison story!" I said, "It is?" Then my secretary told me Harlan Ellison was on the other line. Harlan said, words to the effect, you ripped me off. I said, yes, I know, I just found out about it. That admission calmed him down. I asked him what he wanted. Should we turn this over to the lawyers and let them work something out? I assured him that there was no contention, that Marvel did it and would fess up to it. Harlan's damages, by statute, would have been in the hundreds of thousands of dollars, and he had us dead to rights. But, he said he'd settle for the same money as Bill was paid to "write" the script, an acknowledgement, plus a lifetime subscription to everything we ever published. Done. Thank you, Harlan. I wanted to fire Bill, but he had a friend upstairs — the financial V.P. — who resisted. It was my call. I could have fired Bill over his objections, but I decided, stupidly, that the subsequent hostile relationship with the financial guy would be worse than policing Bill better. P.S. Marvel had a program, in those days, that paid for college and college level courses taken by employees, up to 100% for courses directly job related. The financial officer decided what qualified, and for what level of support. He decided that helping put Bill through LAW SCHOOL qualified, but Joe Rubenstein's painting classes justified only the minimum support. P.P.S. Immediately after passing the bar, Bill's first act as a lawyer was SUING MARVEL regarding issues with his contract. Speaking of the Hulk I was wondering if you could shed some light where the idea of the child abuse story came from. There has been much speculation about this from different people including Barry Windsor Smith. I have never heard your side of the story. I have the same run of Hulks…give or take. Favorite Hulk line – "Hulk like beans"
I have a near complete Hulk collection from Hulk#1-6 & TTA#59 up past Hulk #300. I am missing some between TT#101 & Hulk #150, but I have quite a few of them. Hulk has been drawn or inked by a diverse number of artists, including people we'd categorize as comic legends. Some names you might not expect include Carl Burgos, John Romita Sr., Bill Everett, John Buscema to name a few. Despite that, the books with Trimpe's name stand out as my favorite. Either way, whether you say it leans more towards Severin or Romita Sr., those are both compliments. Both of them drew better stories than 90% of the artists today. One thing Hulk fans may not realize is that Stan Lee didn't leave a gap in continuity after Hulk #6. Hulk was on the stands every month between Hulk #6 and TTA #59. He showed up in FF#12, Avengers #1-5, & Amazing Spider-man #14. His role in the other titles bridged the gap. It makes me wonder if Stan's motivation for crossovers was partially due to his desire to keep the characters published. Marvel had restrictions on the number of titles they could release imposed by the distributor. I always like Hulk because he was no harm to anyone if you left him alone. If you pissed him off, he fixed his problems. If you pissed him off more, he fixed it even better. There was no mulling over morality or guilt. Trimpe captured the calm Hulk better than anyone. He captured the muscular and capable Hulk better than anyone. I don't care for the "monster" angle or comparing him to Frankenstein. I see him as a person of principle. @ Defiant1 – Herbs art changed over time. When he 1st started I could hardly tell the difference between his and Marie Severins version, which I love. Hers is my favorite Hulk. Over time Herb evolved his to something closer to Romita Sr or John Buscema. The line work changed. Not that its BAD, just different and an evolution of style..
Herb was my favorite Hulk artist. Nothing flashy, but he got the job done and his rendition of Hulk is in my opinion the best. My best friend in high school was a test pilot and an aerospace engineer (he works at JHUAPL now). The irony is that I've never flown in a plane at all. I got to stick my nose into the rear end of an X-35 with the lift engine removed, but the only flying I've ever done was a tethered hot air balloon once and rides at an amusement park. Great story since Hulk was my favorite character. Thanks for the long answer, JC! I didn't know anything about your pre-Gemstone career and had no idea how far back your connections with Jim went. I consider you part of Jim's extended family of creators, so there's no risk of "hijacking" in my eyes. I was always writing, no matter what job or classes at school I had. I started interviewing creators because Jim's work at VALIANT got me excited about comics. My first paying gig in the comics field was, believe it or not, a PR piece for DEFIANT. That lead to an introduction to Bob & Carol Overstreet and Gary Carter at Overstreet Publicaitons, for whom I immediately started freelancing immediately. 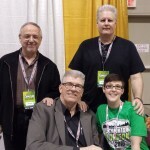 When Bob sold his company to Steve Geppi, I joined Gemstone Publishing, where I've been for the past 16 years. I have freelanced during that time and written a lot of comics, but working with Jim is dream achieved for me. So, not only did he inspire me when I was a kid, his company gave me my first paying gig in the field and introduced me to the people who would employ me. My apologies, JayJay! YOUR choice! I beg forgiveness from the blog elf! JC, you were in the rental car business? I wonder how you got from there to the future of MIGHTY SAMSON. 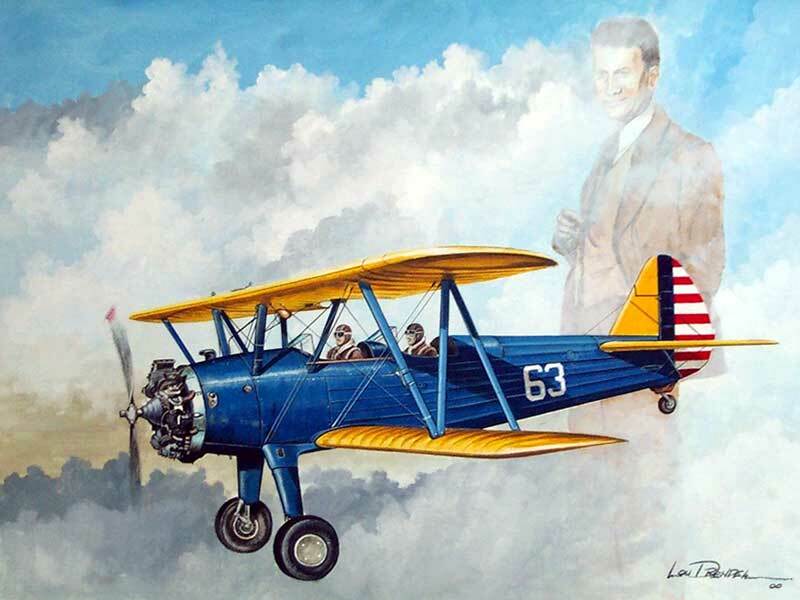 As a semi-retiree, Don Stearman, whose dad invented that plane, worked for me at Avis DFW. He seemed like a nice guy, though I didn't know him very well. Stephen Coonts, the novelist, did a great non-fiction book about flying around in of them, too. WHO's choice of a painting? 😉 Jim didn't know until now that I put that in there. Creative license from the blog elf! lol. If Bill Sienkiewicz is Spider-Man, Herb Trimpe is Phantom Eagle! I'm glad Herb made your father's dream come true. What a moving story. I was on the verge of tears. Your choice of a painting to illustrate this story is fitting. Man has only been in the air for about a century, yet his passion for planes rivals that of his far older love of horses. Do tell your skydiving tale!